Annnnd... it's that time again. Time for PD Interviews Round 3 (or "tres," if you're super cool). Our very own Krysta Peterson will be getting her 15 minutes of fame behind the camera this FRIDAY... so be sure to either post your questions to this blog entry, or to e-mail me (sarah.scott@mannaproject.org) BEFORE this Friday (April 16th) at NOON. 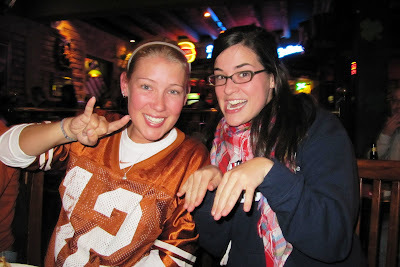 Krysta cheering on her Longhorns during the BCS Bowl game in January. Send in those burning questions!